Users of free office suite LibreOffice should be pleased as punch today. Version 4.3.2 debuted today with 80 fixes that address interoperability issues when reading or writing Microsoft Office DOCX, XLSX and PPTX files. Release 4.3.2 is the second minor release of the LibreOffice 4.3 “Fresh” family. People interested in technical details of the release can access the change logs here. Users may download LibreOffice 4.3.2 “Fresh” and LibreOffice 4.2.6 “Still” from this download link. 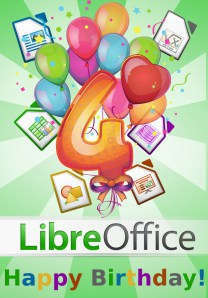 The update arrives just before the fourth anniversary of the LibreOffice project on September 28, 2014. LibreOffice is available for Windows, Mac and Linux platforms. The LibreOffice community is said to be gaining traction for the past four years, attracting at least three new developers per month plus several volunteers active in localization, quality assurance and marketing and development of local communities. LibreOffice is now available in over 100 languages. Show your appreciation for the LibreOffice project by making a donation.